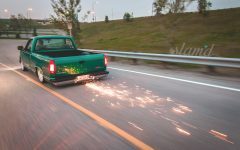 Like it’s namesake Kryptonite, Matt Dower’s 1993 Sierra is capable of stopping the most seemingly super-trucks, dead in their tracks. 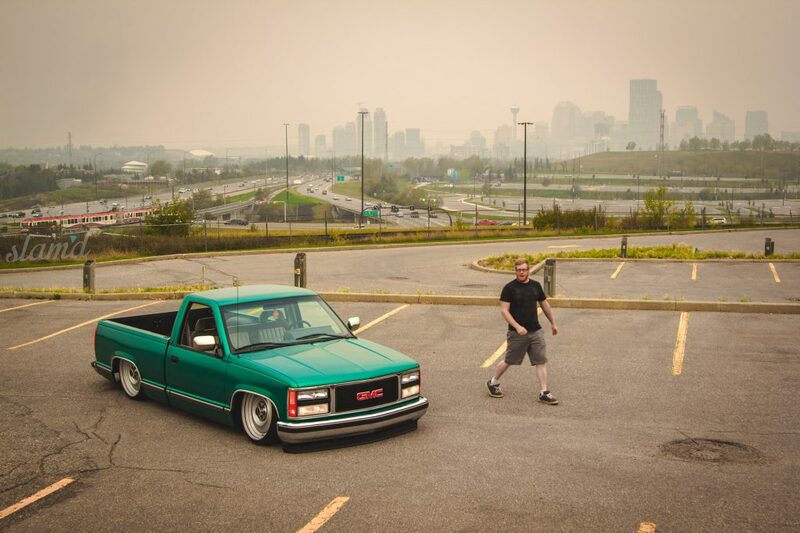 A proper intro ought to mention that Matt’s Sierra can leap the competition in a single bound. 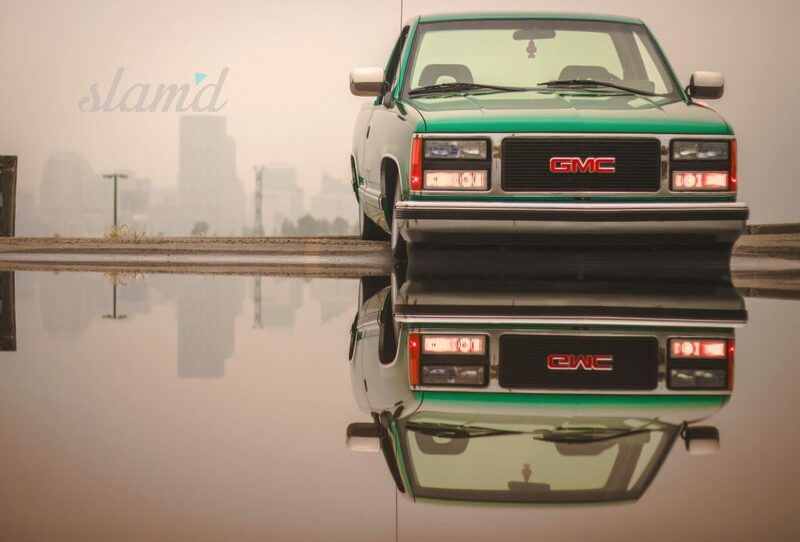 This GMC’s electrically emerald exterior is easily one of the most powerful colors we have ever come across, while still keeping it totally classy. This may not be a comic book, but we are proud to showcase Kryptonite, a clean and classy build, demonstrating Mr. Dower’s impressive work. 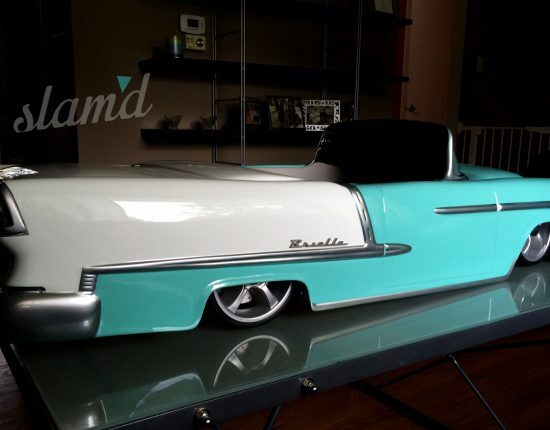 Matt is no stranger to building stellar rides and he has plenty of them under his automotive belt. 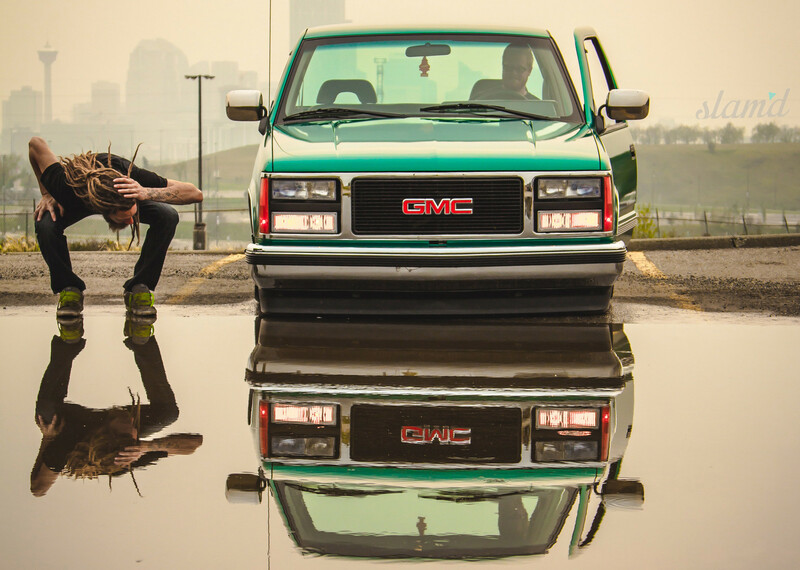 His resume includes several VWs as well as multiple trucks, built for both on and off road application. With this sort of experience on tap, this build came together in just eight short months. 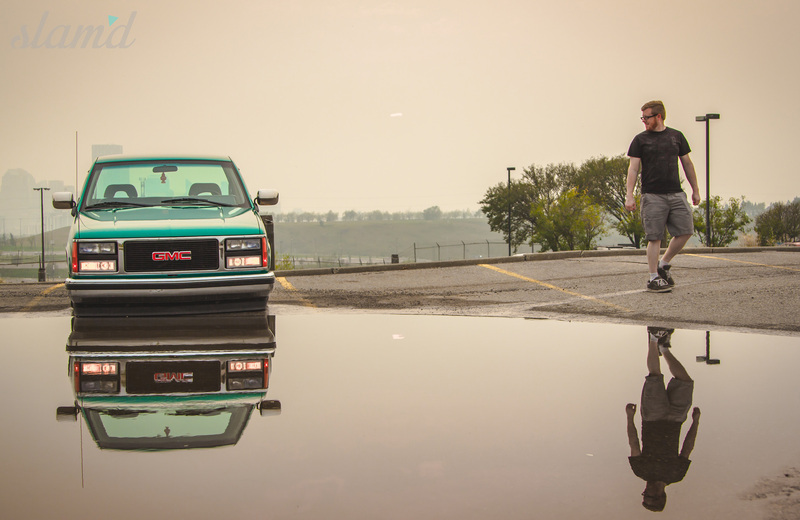 Matt was able to put together this ultra clean Sierra, blending the modern sport truck with the old school flavors of yesteryear paying homage to the ’90s trucks scene. In an age where new body styles and late model crew cabs are all the rage, Matt opted for a modern classic as his next build’s platform. 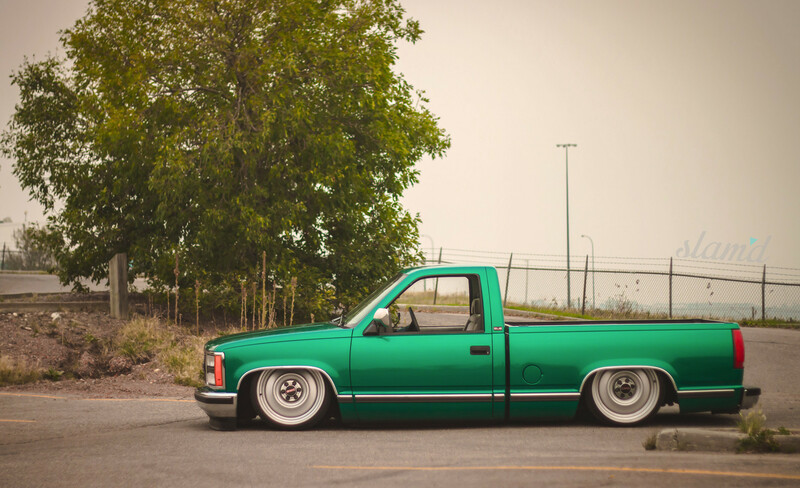 When the truck landed in Matt’s lap he knew the plan was to take this Sierra from trashy to flashy. 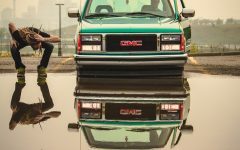 After a close walk around of the wickedly green Sierra, it becomes clear that Matt obviously knows a thing or two about building killer Slam’d rides. Simple, clean, and bitchin’; these adjectives became the name of the game for Matt’s newest project. 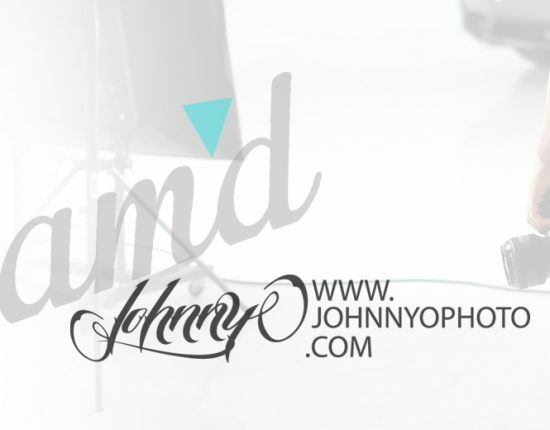 As with any work of art, process often begins with a blank canvas. In Matt’s case, things started with a pretty solid canvas. 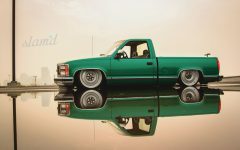 The truck was in great running and driving condition. Because of this, he decided to tackle the suspension first. 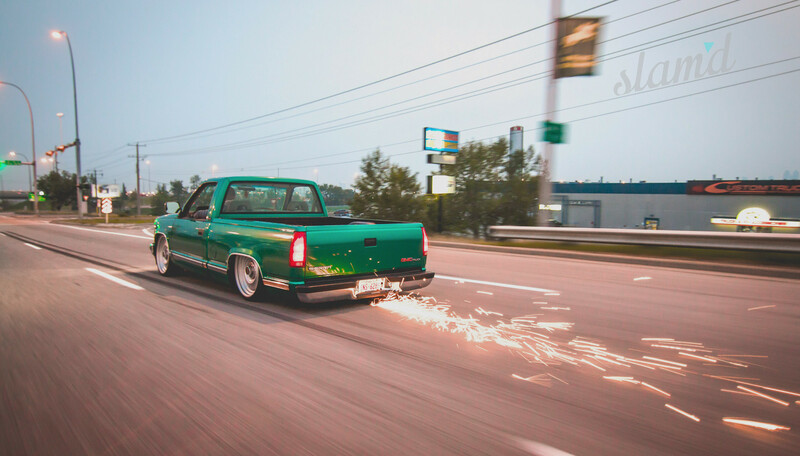 Up front, a host of fabrication was completed to accommodate the stance and ensure the truck drove straighter than a speeding bullet. 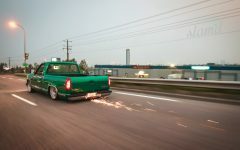 Steve Woodward of the Bag Barn in Camrose, Alberta supplied the suspension parts for Kryptonite. 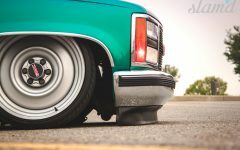 The factory control arms were modified to allow the Air Lift Dominator ‘bags to function properly. 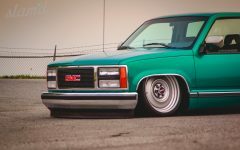 Rounding out the mods up front, the chassis was notched to allow clearance for the tie-rod ends and help lay the GMC flat. 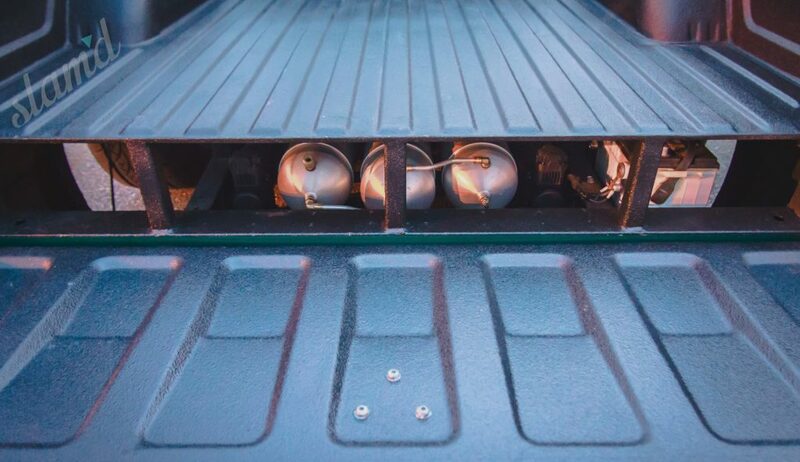 Trailer fenders were installed to keep debris out of the engine bay, while cruising through three of the four seasons in the harsh conditions of West Canada. Under the truck’s bed floor, which was raised 7.5 inches, fabrication continued with a step-notch to allow proper travel for the rearend. 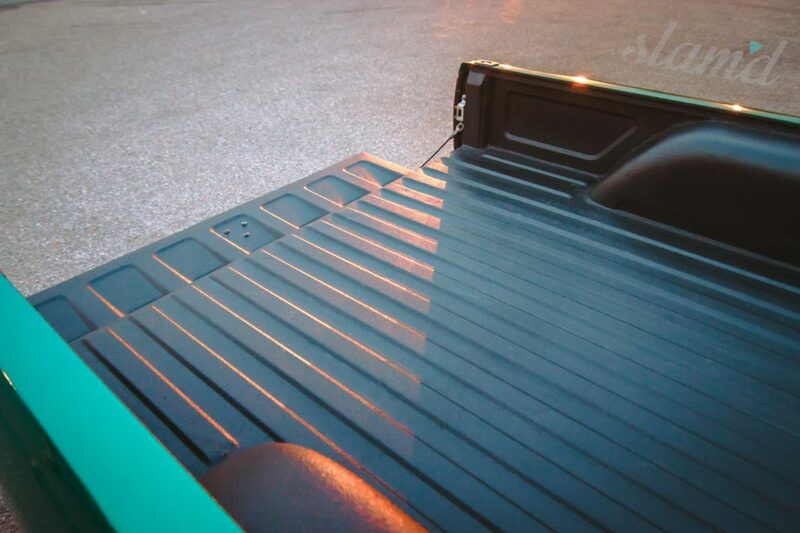 A custom fuel tank crossmember was crafted for the necessary clearance. This also allowed additional space for an extra crossmember to be added. The air tanks, compressors, and air management were bolted directly to the additional crossmember. The wiring runs cleanly along the chassis and a 2-link with pan-hard bar keep the rearend in place while Matt shreds the rubber of his Lexani tires. 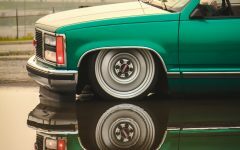 The rollers on the truck continue the overall factory GMC theme with a set of 6-lug 22-inch steel “transport” wheels that were bolted to the 3/4 ton rotors. 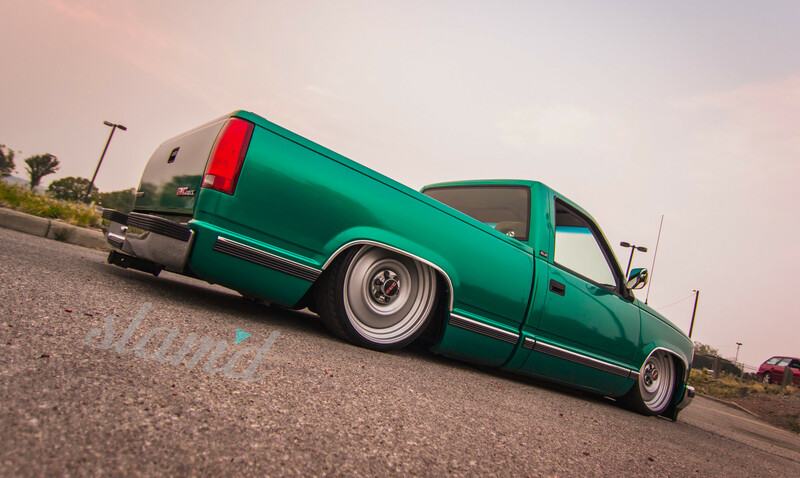 Matt opted for a 6-lug conversion to maintain the OEM look and overall budget of the build. 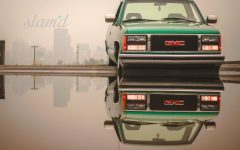 We have a feeling that 88-98 GMC trucks are poised for a huge comeback in the very near future. 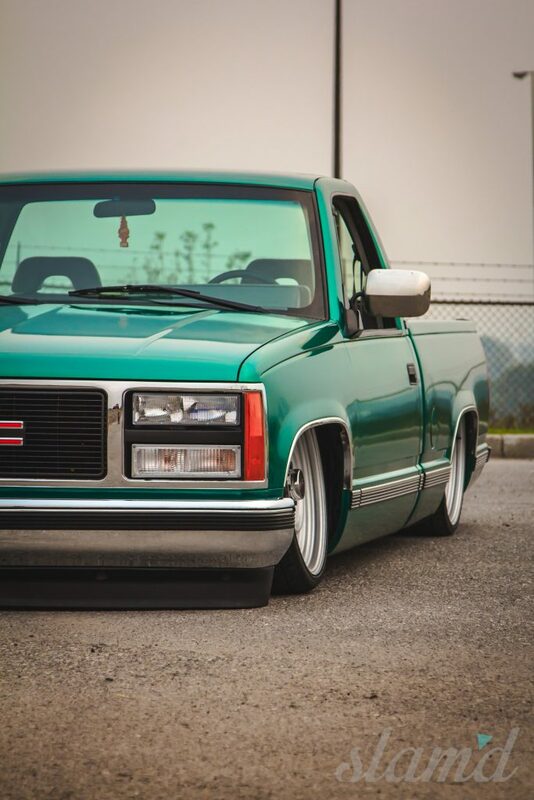 Although, we can’t exactly call it a comeback since 88-98 OBS trucks have been wrecking shop for years. 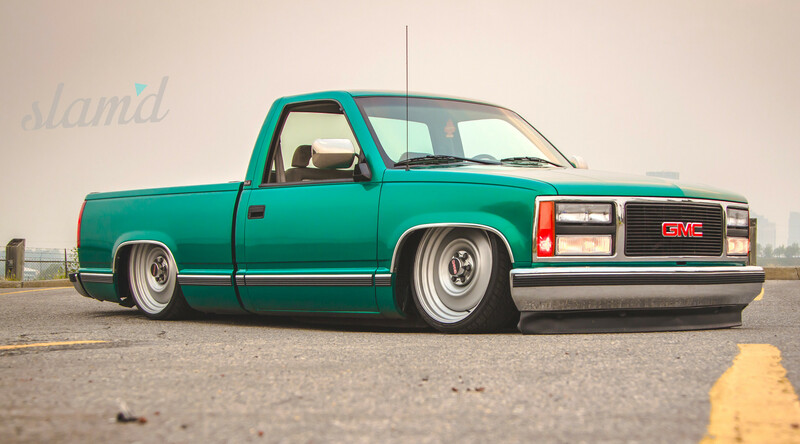 After the suspension and wheel set up, the next order of business was getting the body of his Sierra to be just as clean and but with that same OE look. 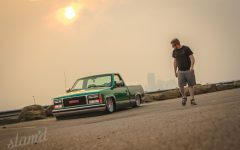 The truck’s exterior definitely wasn’t in the best of shape when Matt acquired it, but this wasn’t about to stop him and his plan to put a stake in the ground with this build. 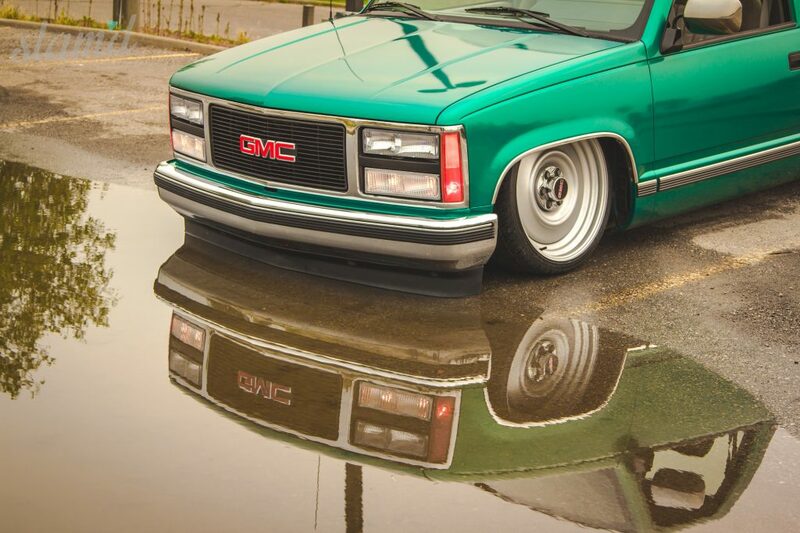 Right out of the gate he envisioned a simple factory looking ’93 GMC. 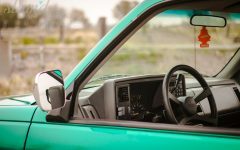 Knowing that other 88-98 regular cab pickups have made waves in the truck scene, Matt felt confident in his plan. 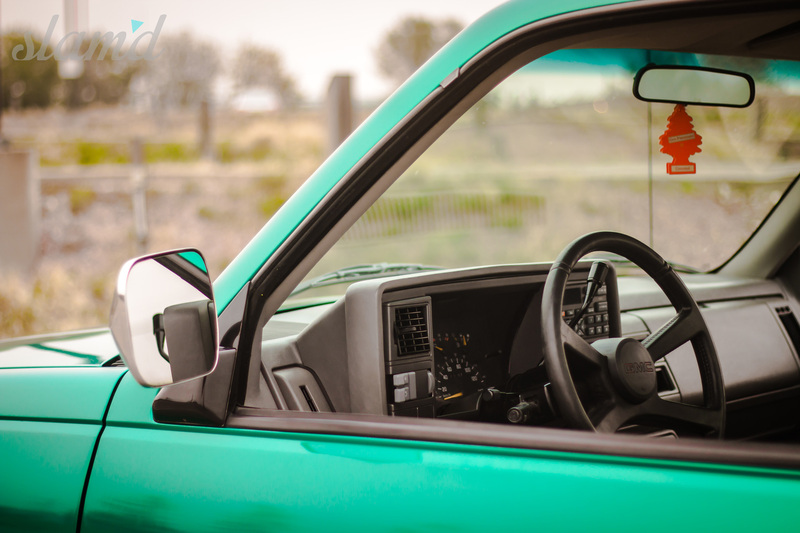 Completing the mods on the truck consisted of maintaining and restoring all of the exterior trim, chrome mirrors, badges, etc. 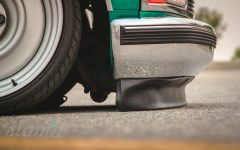 The objective was to make the truck appear as if it had just been whisked off the dealership lot, back in 1993 and immediately put flat to the pavement. Matt chose Dublu Inc. to perform a vinyl wrap, topping off the color change on the truck. The extensive wrap includes covering the door jams to ensure it came out as clean as a full paint job. 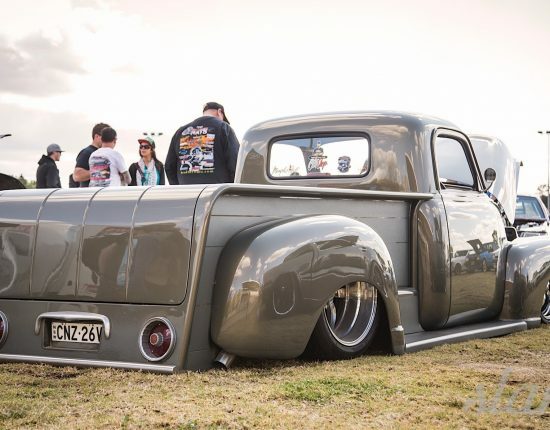 Normally a classic is considered 25 years or older, but that didn’t stop Matt from taking this build on as if it were a full restoration project with a serious resto-mod attitude. One of the key aspects to this project was the fact it already ran excellently when purchased. 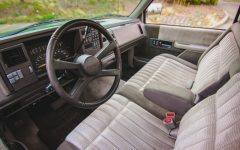 This perk fell right into Matt’s master plan; for the full OEM look, the truck needed a strong power plant that didn’t require too much attention. 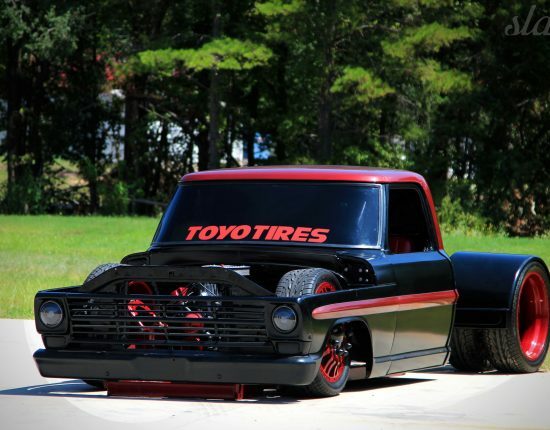 Matt kept the factory TBI small-block V8 stock. This again allowed for the budget and timeline to be kept manageable. 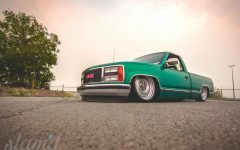 Headman shorty headers were bolted to the block and the custom exhaust was ran just behind the cab. 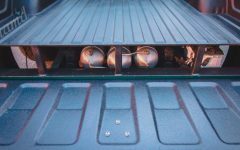 The exhaust set up keeps road and engine noise to a minimum while inside the truck but still allows the truck to be aired out without any dragging issues. 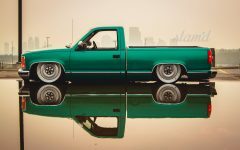 The factory 4L60e 4-speed auto trans finishes off the drivetrain. 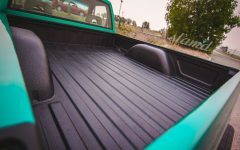 But of course some major detailing went into the engine bay and we must say that the overall appearance looks cleaner than many full-on show trucks we have seen. 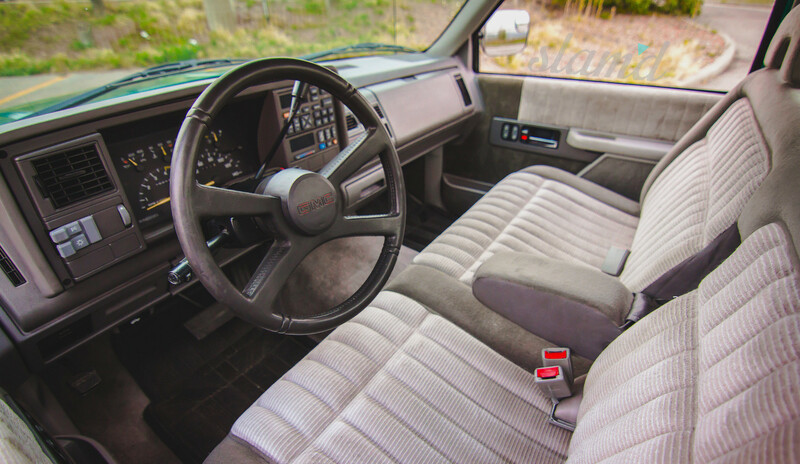 Take a guess as to the interior styling of the truck. 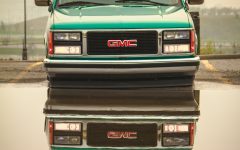 Yes, it looks exactly like a 1993 GMC Sierra. The factory theme of the build wasn’t about to stop upon opening the driver door. 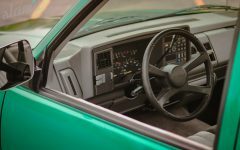 One of the many aspects that remains OEM is the fully functional and restored AM/FM cassette player in the truck; talk about some OG style right there! 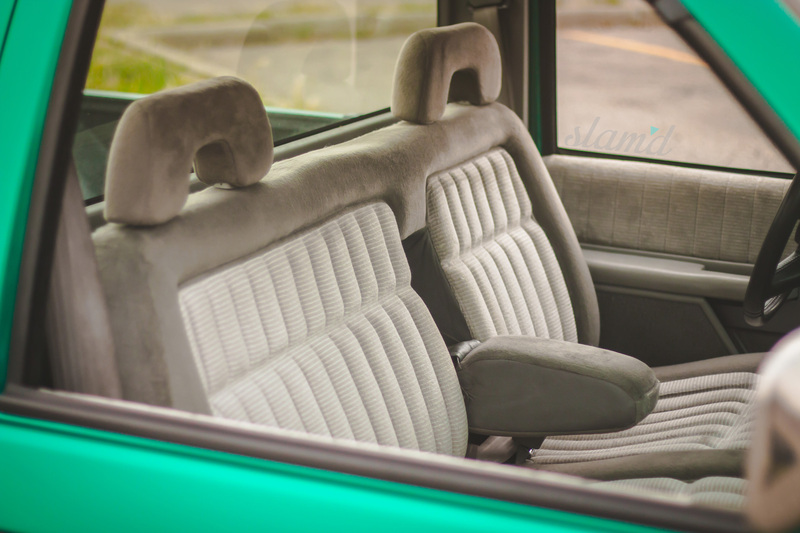 The bench seat maintains the comforts and ergonomics of a standard cab pickup. 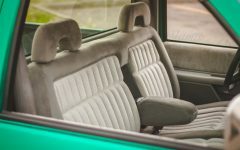 While the AccuAir controller is hidden away in the ashtray. Rumor has it, that Matt spends his weekends searching for vintage hair-band cassettes to blast while driving Kryptonite. 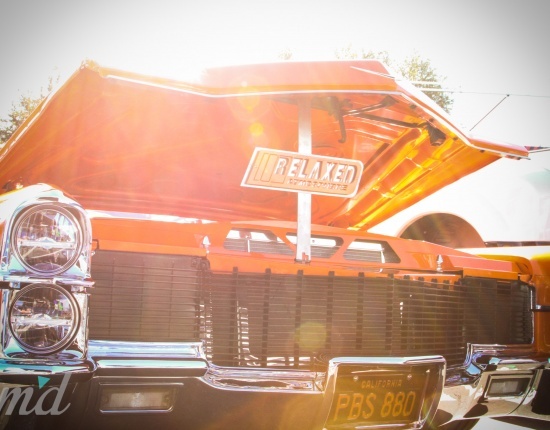 Of course, cruising wouldn’t be complete without some serious ’90s tunes. Typically the mention of Kryptonite leads to a discussion on overcoming weakness and if Batman could use it to defeat the Man of Steel. However, the moral of this story is that a project doesn’t have to include every trendy mod in the universe, nor does it need the biggest budget in the galaxy. 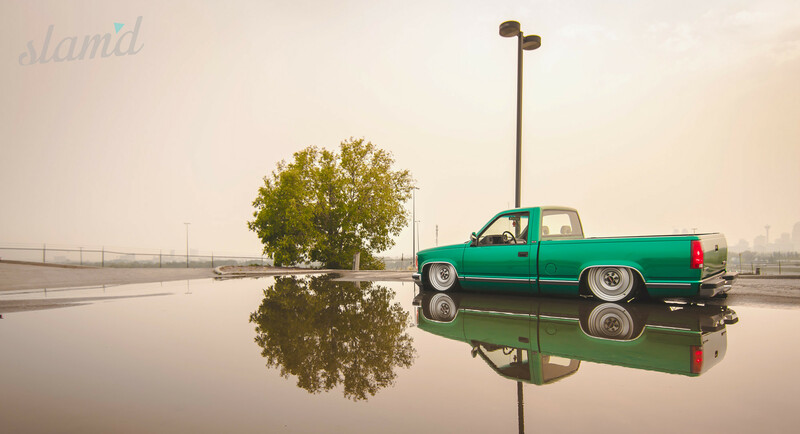 Matt Dower built a truck that encompasses beauty, proficiency and above all, personality. 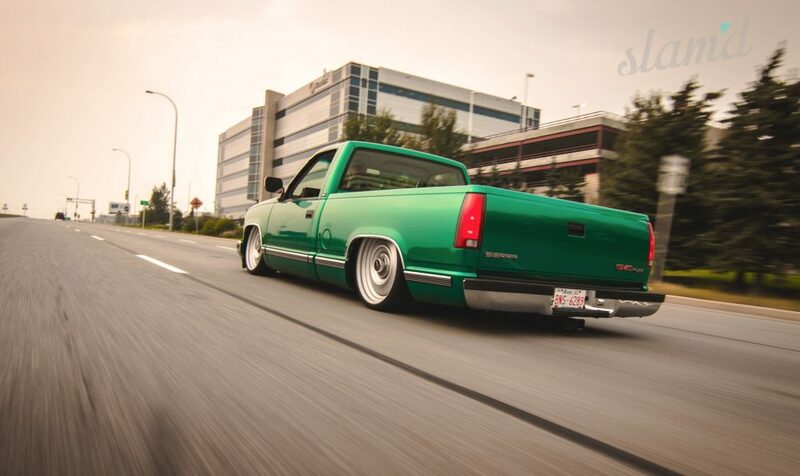 Bumper to bumper, Kryptonite is one of the cleanest trucks out there. It accomplishes an amazing feat (on par with being more powerful than a locomotive) of maintaining OEM design and styling, while staying totally unique. Matt did the work himself from beginning to end, during the winter months in Canada. Researching his project prior to starting, resulted in a well executed plan and plenty of enjoyment for Matt both in the build process and now behind the wheel. 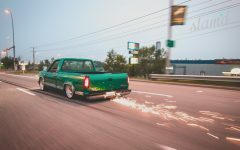 All of this has earned Matt the classic hot-rodder thumbs up, from enthusiasts of nearly every automotive genre. Matt did want to give a special thanks to Joe Denny and Steve Woodward for their contributions to the build. Until the next feature, keep it classy and Stay Slam’d.